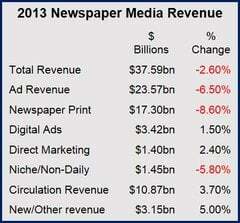 Despite a rise in circulation revenue, overall 2013 newspaper revenue fell 2.6%, according to figures published by the Newspaper Association of America. While circulation income increased to $10.9 billion, overall revenue dropped 2.6% to $37.6 billion. Digital-only-circulation revenue increased by 47%, while bundled print + digital circulation rose 108%. Some companies are shifting to all-access packages. Print-only circulation revenue from home deliveries and single-copy sales slumped 20%. Advertising revenue declined by 65% to $23 billion in 2013. Over the last few years, newspapers in the US, Europe and much of the rest of the world have struggled to make up for falling ad revenues from their printed publications with online ads. A growing number of newspaper readers are switching to the Internet and mobile devices. The number of online news sources has exploded over the last decade. Readers have switched to getting their news online. US newspapers’ digital advertising revenue grew by 1.5% in 2013 to $3.42 billion, nowhere near enough to compensate for print advertising revenue’s 8.6% decline to $17.3 billion. Retail advertising fell 8%, national advertising also declined by 8%, and classified ads slumped 10.5%. The Newspaper Association of America reported a 2.4% rise in direct marketing advertising revenue to $1.4 billion. However, non-daily and niche publications reported a 5.8% fall in ad revenue to $1.45 billion. Approximately 24% of the $3.42 billion in digital ad revenue is “pure-play” digital advertising, i.e. ads that appear only on digital platforms and not in the print products. Other revenues – non advertising or circulation – increased by 5% to $3.15 billion. 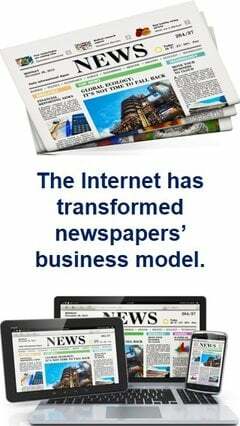 In August 2013, the founder of Amazon.com, Jeffrey P. Bezos, agreed to buy The Washington Post from the Graham family for $250 cash. Fifteen years ago, the Washington Post, the most widely circulated newspaper in the Washington D.C. area and one of the most prestigious publications in America would have declined any takeover bid that was not in the billions of dollars. Newspapers need to adapt rapidly to a changing environment. Newsweek stopped issuing print publications in the United States in 2012 and concentrated on an all-digital format, changing the online-only version to Newsweek Global. The newspaper continued to struggle and was bought out in August 2013 by IBT media. Also in August 2013, the New York Times sold The Boston Globe for $70 million, two decades after paying $1.1 billion. It was sold to John W. Henry, owner of the Boston Red Sox baseball team and Liverpool Football Club. For the major newspapers to survive they will need to adapt rapidly to a totally different business environment. Not only are readers moving rapidly towards online-based news sources, but their preferences are also changing. Investigative journalism with long, in-depth articles are gradually giving way to short snippets bit-size information.